There are a number of different types of rigs that you can use on commercials for carp fishing, and new versions and ideas are appearing all the time, but which one is really the best? By far and away the most sensible choice is the Method feeder. It allows you to tuck a bait inside a ball of feed and have both mixed together once the feed breaks down in the water. It’s also a self-hooking rig, meaning there’s no hitting tiny knocks on the quivertip. When a fish is on, you’ll know about it as the rod goes round! Making the rig is easy, too. Most fisheries insist on your set-up being free-running, but modern tackle means that even elasticated feeders can be used safely. Guru has its X-Safe system that allows the feeder to pull free of the line in the event of a breakage or the rig becoming snagged. Elastic acts as a shock-absorber when playing a big carp under the rod-tip, which greatly reduces the number of last-minute hook pulls. Big carp can give savage bites on the Method, so don’t skimp on lines. A tough mainline of around 8lb is the order of the day, matched to a 4ins hooklink of low diameter line in a similar breaking strain. a barbless eyed carp pattern in sizes 16 or 14 will do. The eye is important, as it will allow you to hair-rig baits. When a Method load breaks down, you want your hookbait to pop out and be easily visible to the fish, so give them something bright. A hi-viz orange or yellow mini boilie or wafter, or a brightly-coloured 6mm pellet are good options but often, a plain hard pellet can bring equally good results. Don’t forget dead red maggots or a piece of corn either. Your feed is moulded around the frame of a Method feeder using a special mould, and there are only two choices of feed here – micro pellets or groundbait. 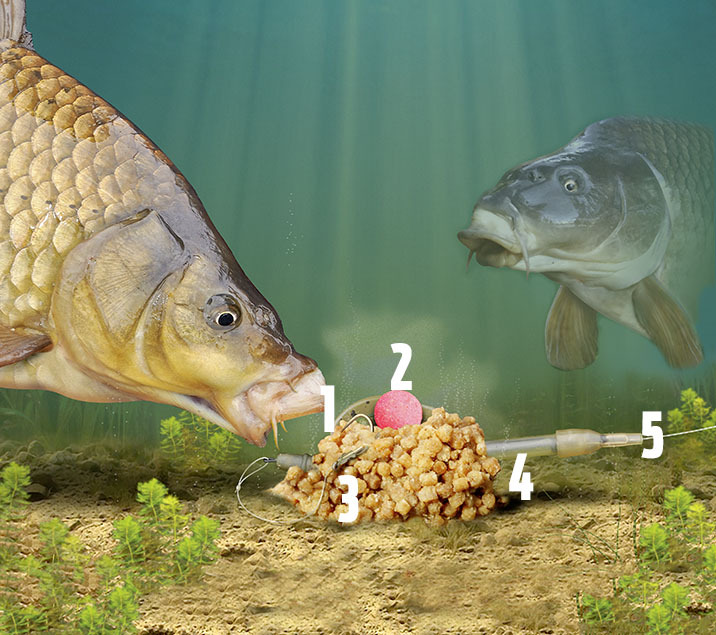 For out-and-out carp fishing, pellets work well. These need to be dampened slightly to help them stick around the feeder. Fishmeal groundbait comes into play when the carp are of a smaller stamp, and normally this is mixed 50/50 with micro pellets. Method feeders range in size from tiny 15g models to massive versions taking over 50g. The size you pick is dependent on how far you need to cast, and any underwater countours. For long casts, obviously a big feeder will do the job but for short chucks, a much smaller model will do. Heavy feeders also come into play if you are fishing on an slope running away from an island, the extra weight helps the feeder to grip the lakebed as opposed to sliding down this slope. If you go down the elasticated feeder route, pick the Guru X-Safe system. This sees heavy pole elastic inside the feeder body stretch when a fish is being played, helping subdue the carp in double-quick time. Should a fish get snagged and the mainline break, the feeder can pull free to prevent the carp being tethered.